Binalong workshops will have a maximum of 5 people each day. Workshop duration is 6 hours each day. Equipment and Glass Provided. Lunch, morning & afternoon tea provided each day. 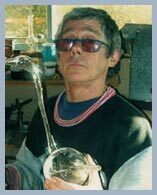 I have been working with glass for more than forty years. In this time I managed a family glass blowing business making scientific glassware including calibrated apparatus. Leaving the family business I set out to establish my own business making creative glass. I built furnaces, making glass and developed skills and knowledge in this area. I studied this area in Sweden at the Orrefors Glass School and in Kosta Boda Glass before returning home to continue this line of work in South Australia. Subsequently, I set up a studio in Binalong 20 years ago concentrating on Lamp work as my main area of interest. I studied for 3 years in the Canberra School of Art and have been invited back to set up and teach Lampworking courses to the students and to conduct workshops. I was invited to set up the Lampworking Department, RMIT University Melbourne, and to teach the beginners course. I assisted in setting up the Lampworking department in Sydney School of Art and co-taught the Lampwork course preceding the Ausglass Conference in 1997. Throughout these years, I have continued to teach all aspects of glass to those who wish to learn with Lampworking the main focus of my teaching. I have assisted many to set up their own workshop and keep in touch as I see them successfully establish their own thriving workshops enjoying the excitement and satisfaction in being creative with Lampworking. Workshops can be conducted as private lessons for as little as 2 hours, half or one day duration. Most are around 5/6 hours a day for 2 days straight. They can be longer if preferred. Maximum 5 people in a workshop. The aim is to teach students to be competent in safety aspects with equipment and to teach them to be confident and proficient in using glass to express their art. Finally, should they desire, to help them establish their own workshop with expert advice on safety in setup with correct tools and equipment needed for such a project. Lampworking is the process in which glass, in the form of rods, strips or tubes, is manipiulated with heat in a single flame from a bench burner. These hands on workshops cover the development of blown forms and the manipulation of solid glass to create a variety of objects. Students can experiment with a variety of lampworking techniques, bead making, blowing, solid working applicable to jewellery, object making, and small scale sculpture. Students are encouraged to be creative and to experiment in developing their own ideas. Colouring glass, types of glasses, annealing, tools, equipment and studio setup is covered. This exciting class, exploring the Art of Glass Lampworking, is suitable for beginners and for those who have lampworking or other glass working experience and wish to expand their skill and knowledge.